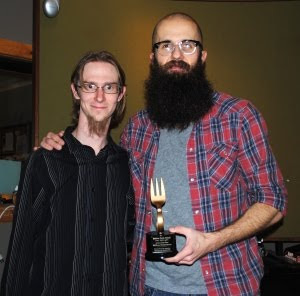 If you've been holding your breath for these past 4 months to find out who won the 2010 Golden Fork Awards, then you belong in the Guinness Book of World Records and we want your autograph. Thanks for being so patient. We were privileged to get to present William with his trophy March 4th in Abilene at the Paramount Theater. He was very kind to make it a part of the show that night, sitting it on his stool and referencing it throughout the concert. Other trophies will be presented/mailed to winners in the next few weeks. Thanks again and look forward to seeing who wins this years awards.